Makeover Monday: An “Under the Sea” 3rd Birthday Party | Committed. Guests arrive. Decorate cardstock fish (my friend kindly cut these out the night before, just a simple fish shape). We provided crayons, glue sticks, glitter glue, stamps, stickers, confetti, scissors, crepe paper streamers, and origami paper to decorate. Offer drinks and access to food whenever anyone wants. We put two low tables together in the living room, which was used for crafts, lunch, and cake. Eat snacks or lunch, free time. Play with balloons and share toys. Two hours (11am – 1pm) was perfect for this age group. Everyone was engaged and having fun until the absolute last minute, when the meltdowns started to happen. Most of the kids in this group tend to nap in the early afternoon on the weekends. A simple birthday party activity for 3 year-olds: decorate fish, then magnetic fishing game. Tie magnet to string (the “O” shape makes it easier. I had very weak disc magnets on hand and had to make little sacs of 3 to be able to lift the fish). We made 4 fishing poles so several kiddos could fish at once. It kept them busy for about the last 10 minutes of the party, and when they “caught” a fish, they got a goody bag! Like I said, there’s a bevvy of information on adorable food ideas that are 90% sweets AND labor-intensive. I’m prone to signing myself up for these things because I love a project. But again, it’s so not worth it when it comes to a bunch of toddlers and little kids. Everything was buffet-style so guests can take as much or as little as they like. Simple, easy food for an “under the sea” birthday party. Sometimes it’s worth going Betty Crocker. Kiddo is a very thoughtful gift-opener, which means it takes hours, sometimes days to open her presents. While I wanted to express gratitude for any presents, I didn’t want to torture a group of squirmy toddlers by making them sit through a lengthy gift-opening session. When guests arrived, I thanked them and explained that we were going to open presents after the party. Everyone seemed fine with that decision. Paper lanterns + streamers + ribbon = jellyfish! 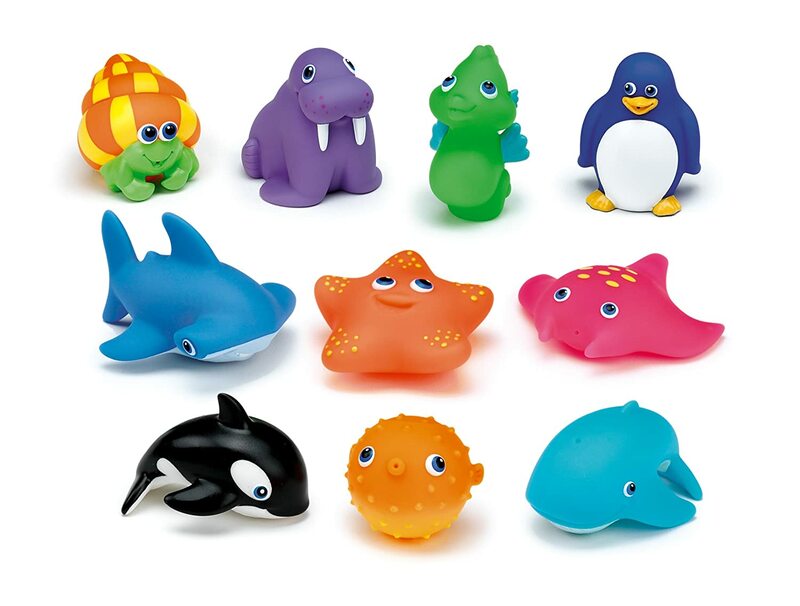 Munchkin ocean bath toys on Amazon. Dollar store kraft bags + stamps make it easy! Overall, keeping the activities simple, and leaving the timing open-ended make it for a good time for kids and parents alike (I think!) We got to talk with some of the parents in our class, and the kids had a good time kicking balloons around and playing with stamps. When I asked kiddo what her favorite part of the party was (expecting her to say “playing with friends” or “catching fish”), she said “CAKE!” I guess chocolate trumps all. How about you, readers? Have you had successful birthday parties for little ones in your home? What worked best for you? oh my gosh, the jelly fish. amazing, and so smart and creative! thanks so much for visiting my blog and commenting on my living room redo. i always have a blue crush..it’s everywhere practically!